E logo pela manhã chega-nos ao mail um daqueles briefs que consegue tocar vários dos nossos tópicos de uma só vez: AI, media, revoluções sociais, e o Trumpas. Metessem barulho cómicos e nazis e uma tirada à Arte pela lateral, e tínhamos o nosso café na cama. Top-o-tha-mornin', punx! On his obsession with artificial intelligence: "I've been in the technology business a long time and we went from a period where we automated ... journals and 10-key adding machines ... with spreadsheets; then we connected them into networks; and then we connected networks into the Internet. And that was over the course of 30-plus years. What we are going to see over the next 5 years will dwarf that." "It's going to change media. It's going to change the nature of work. It's going to change what we expect from people. It's going to change the workforce. It's going to change the tax structure." "If you work for software, you're probably going to need to start looking for a job. ... [B]eing a philosophy major, a foreign language major I think is going to be far more valuable than being an accountant or being a lawyer." 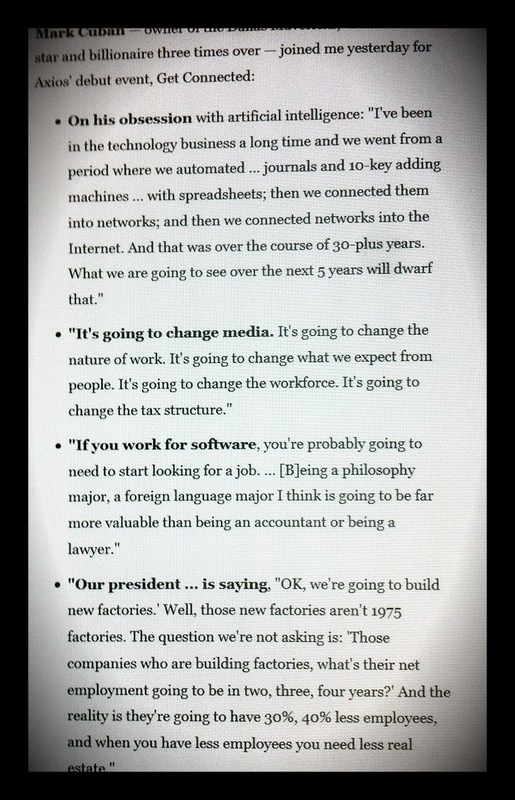 "Our president ... is saying, "OK, we're going to build new factories.' Well, those new factories aren't 1975 factories. The question we're not asking is: 'Those companies who are building factories, what's their net employment going to be in two, three, four years?' And the reality is they're going to have 30%, 40% less employees, and when you have less employees you need less real estate." Porque é o único sítio onde lhes dói, e estão no business de empurrar o prejuízo.